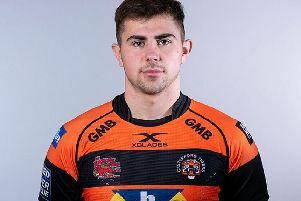 Recent signing Daniel Smith is in contention to make his debut for Castleford Tigers against the team he has just moved from, Huddersfield Giants, but may have to wait for his first taste of action with his new club. 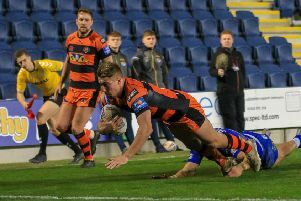 Smith missed out on selection after signing last week, but is included in the Tigers’ 19-man squad for the trip to the John Smith’s Stadium. However, with a couple of forwards likely to return from injury and the pack earning rave reviews for their contribution against Wigan Warriors last week the Pontefract-born prop could have to wait again. If he is not selected the 26-year-old will definitely play over Easter and could take the field against another of his former clubs, Wakefield Trinity, in the first of the holiday double headers at the Mend-A-Hose Jungle on Thursday week. On his prospects of playing this week Tigers head coach Daryl Powell explained: “He has got a chance. “First of all I’ve got to make sure he’s comfortably with what we’re doing and second I’ve got to see where the team’s at. “Our pack was pretty good at the weekend and the week before against Leeds so I’ve just got to make sure I get the combinations right.